At World Wide Developer Conference (WWDC 2015), Apple has finally unveiled its next generation most advanced mobile operating system iOS 9 Firmware for iPhone, iPad, iPod Touch and Apple TV devices, and also released the Xcode 7 Software update. The latest iOS 9 Beta Firmware Update (Build: 13A4254v) and Xcode 7.0 Beta Software Update (Build: 7A120e) are instantly available for all iOS developers and iOS non-developers (general public users) for testing and experimenting of newly added features, functions and services. Apple iDevice users can upgrade and install official iOS 9 Updates for Free. 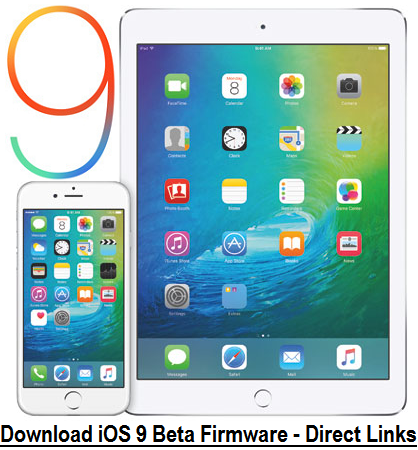 The Direct Download Links of iOS 9 Beta IPSW and Xcode 7 Beta DMG for iPhone 6 Plus, iPhone 6, iPhone 5S, iPhone 5C, iPhone 5, iPhone 4S, iPod Touch 5G, iPad Air 2 6G, iPad Air 5G, iPad 4G, iPad 3G, iPad 2G, iPad Mini 3, iPad Mini 2, iPad Mini and Apple TV 3G are available below. What's New in iOS 9 Beta 1 Features? The newest iOS 9 Beta (13A4254v) firmware release notes and changelog contains addition of several new features and functionalities changes with stability, performance, security and bugs fixes, enhancements and improvements. 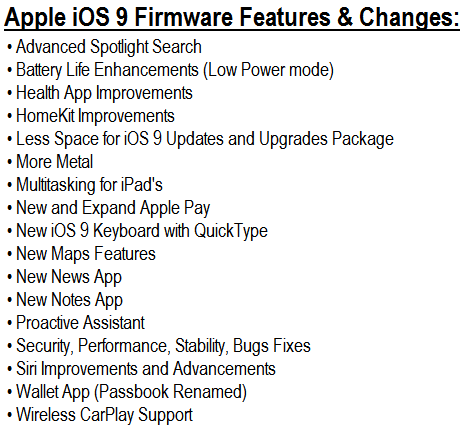 You can read full iOS 9 Firmware Features in below image! What's New in Xcode 7 Beta 1 Features? The recently announced Xcode 7 Beta (7A120e) software changelog comprises with the support of iOS 9 Beta SDK, Mac OS X El Capitan 10.11 SDK, Apple WatchOS 2.0 SDK, Xcode IDE, Swift 2 Compiler, Instruments, Simulator, Command Line Tools, Hardware IO Tools, Audio Tools, Graphic Tools, Auxiliary Tools and Kernel Debug Kit development tools. How to Install iOS 9 Beta Manually? If you're iOS developer, then you can visit iOS Dev Center website to Download iOS 9 Beta 1 Officially, moreover all iOS non-developers (general public users) can install and activate iOS 9 Beta without UDID developer account via iTunes for Free. Download iOS 9 Beta 1 IPSW Firmware and Xcode 7 Beta 1 DMG Files for iPad Air 2 6G, iPad Air 5G, iPad 4G, iPad 3G, iPad 2G, iPad Mini 3, iPad Mini 2, iPad Mini, iPhone 6 Plus, iPhone 6, iPhone 5S, iPhone 5C, iPhone 5, iPhone 4S, iPod Touch 5G and Apple TV 3G via Direct Links and Torrent Links below. How to Jailbreak iOS 9 Beta Firmware? Currently, No Untethered iOS 9 Beta Jailbreak by team TaiG, PanGu or 25-PP is available. NOTE: You can Activate and Install iOS 9 Beta without Apple UDID Registered iOS Developer Account for Free, Click Here to follow guide and tutorial.